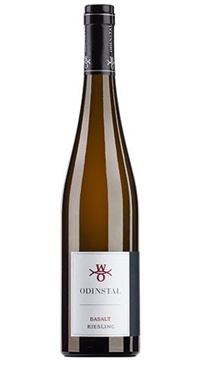 Weingut Odinstal is a six hectare biodynamic Demeter-certified Domaine up in the Haardt mountains of the Pfalz region. The vineyards are among the highest in the Pfalz. On volcanic Basalt, as well as on the Trias soils Buntsandstein and Muschelkalk, owner Thomas Hensel and his viticultural director Andreas Schumann cultivate 45% Riesling, 30% Pinot Blanc, 10% Auxerrois, 5% Rieslaner, 5% Silvaner and 5% Gewürztraminer. The wines are fermented with natural yeasts, partly in steel and partly in oak, while malolactic fermentation is accepted as a natural fermentation. In 2014 Schumann has bottled a remarkable series of authentic, terroir-driven wines. This is vibrant and pure Rielsing grown on steep slopes. The wine is intense with a salty minerality. This is a vibrant and pure Rielsing grown on steep slopes. The wine is intense with a salty minerality.